Abernethy Parish Church is located on Dell Road and worship takes place every Sunday. There is also a modern and well-equipped church hall at this site. However, there are two church buildings in Nethy Bridge, which occasionally causes confusion! The Old Kirk on the Grantown Road (pictured right) , which was the original Parish Church, and Abernethy Parish Church on Dell Road. The Old Kirk is no longer used as a regular place of worship, however it is preserved and cared for by the Abernethy Old Kirk Association. It is available for community use such as concerts and exhibitions, as well as special services, weddings and funerals. The Old Kirk was the original Church of Scotland church in the village. In 1843 following much conflict about a third of the members of the national Church of Scotland broke away to form the Free Church. In Abernethy the minister and the majority of the congregation remained in the Church of Scotland but six elders and some others left. At first there was no Free Church building in Nethy Bridge, but in 1850 the Earl of Seafield gave land near Old Bridgend and the church (now known as the Dell Road Church) was built. The manse behind it followed soon after. 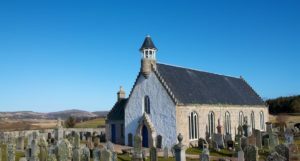 This happened peacefully in Abernethy as the minister and congregation agreed to go into the union and there was little or no move to form a separate Free Church congregation. Finally in 1929 the Church of Scotland joined with the United Free Church to form a reunited Church of Scotland and Rev John A Fleming became the sole minister in the parish of Abernethy. The earliest notice of a manse at Abernethy comes in 1624 when the minister, Patrick Grant, assured the Synod of Moray that “he now hes his residence in the parochin of Abernethie and sall abyd thair and build ane manse besyd his glei’. A year later he was still promising ‘shortly to dwell in the manse of the said Kirk”. A plan dated 1773 shows the manse as an E shape with the central shaft reversed into a short projection at the back. Changes were made for Duncan Robertson in 1907 but when the union of 1929 took place the former Free Church manse was chosen and the old manse sold to the last minister Rev Archibald Ross. Much addition has followed and the manse is now the Abernethy Trust Christian Adventure Centre.